1,high quality and competitive price. Destroys air toxins and Volatile Organic Compounds (VOCs) that are discharged in industrial process exhausts. The RCO system achieves VOC destruction through the process of catalytic oxidation, converting the VOCs to carbon dioxide and water vapor, recycling released energy to reduce operating costs. 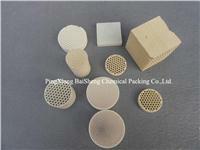 2.Ceramic Honeycomb Material: Cordierite, Porcelain, Mullite, Alumina, Stoneware, etc. 3.Dimensions: 150x150x300mm, 150x150x150mm, Cells 25x25, 40x40 etc.